Hue, the former imperial capital of Viet Nam, has been representing the cultural and spiritual center of Viet Nam for a long period of time. This city is famous for its magnificent architecture of citadel, palaces, pagodas and royal tombs built under the 13 emperors’ of the Nguyen Dynasty in a poetic background of greenery on the banks of the Perfume River. 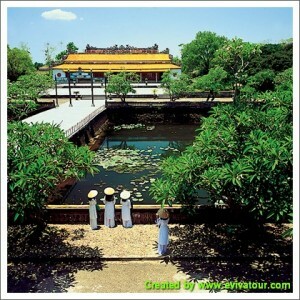 UNESCO has called Hue “an adorable architectural poem”. Hue is a harmonized combination of nature and human inspiration. Picked up for an interesting day to visit Hue: Enjoy a boat trip on the romantic Perfume River to visit Thien Mu Pagoda, the best-known religious site in Viet Nam and the Mausoleum of the Emperor Minh Mang, built in the middle of the pine forest under the plan by the King himself. Afternoon, visit Mausoleums of Emperor Tu Duc and Emperor Khai Dinh, the Imperial Citadel and enjoy royal traditional music in the ancient theatre of the citadel. Visiting Dong Ba Market (Vietnamese dresses and hats, local sweets, stone souvenirs, etc are sold to tourists and experience a typical daily noisy market of Viet Nam). • Lunch at local restaurant. • International airfare & airport taxes at all routes. • All the things are not mentioned in the itinerary.